I moved across the country last spring and meeting new friends has turned out to be harder than I thought. I spent many days at the park attending meet ups trying to make friends. I realized that this was a bad strategy on many fronts. On one really bad play date, I realized that meeting friends is a lot like dating and I was not going to get a second date. Why? After all I am fabulous after all, but I have a trio that truly brings down my first impression rating. You see the park is not a great place to meet me. First of all, I probably haven't showered yet. 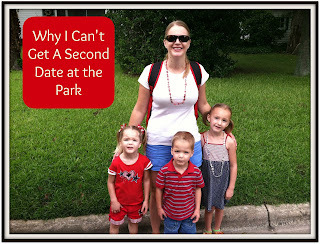 I see the perfectly put together mom at the park and I think why bother? You're just going to get all sweaty and gross at the park. I'm guessing that she is not as lazy as me and is actually willing to take a second shower. Perfectly dressed mom doesn't want to date smelly gym clothes mom. Strike 1! Secondly, I am very distracted at the park. I'm constantly counting 1-2-3, 1-2-3 and no I'm not dancing, I'm counting my kids. They don't exactly like to play in the same area and one of them loves to try to sneak into the woods or parking lot. You have to watch that kid like a hawk. So yeah I'm only catching half of what you're saying. It's not personal I just can't get my trio programmed to stay in the same place. It's been a while but I do remember that listening is an important part of being a good date. Strike #2 for me. I'm going to the other side mom! I can almost promise you that I won't have a bribe snack with me to keep things going smoothly. Once my kids see your kid's snack the whining will be on like Donkey Kong. You will assume that I never feed my kids and then we'll have to leave since their whining is making me want to scream. Strike #3 thank goodness this isn't baseball or I'd already be out. That really bad play date that I mentioned earlier that made me throw in the towel on meeting friends at the park - well allow me to set the scene. It started raining during the play date and the kids were having so much fun that we let them play. It didn't rain long and the kids kept playing. I look over to check on my twins and I see them stark naked going down the slide and up the ladder! I thought it was pretty funny but the other moms were appalled. They felt the need to explain to their kids why my twins were bad for getting naked. Oh please, they're naked, it's not like they're running with scissors. Which we all know is the ultimate crime! However it does give me a hilarious story to hang over their teenage heads one day. And it showed me that I didn't want to be friends with such uptight mothers. As you can see our first date will be cut short for one of many reasons. My fantastic first impression will make you decide to dodge my phone calls. It's OK I totally get it. Sometimes I leave the park and I don't want to be friends with me either. Now just imagine if we met at the pool. 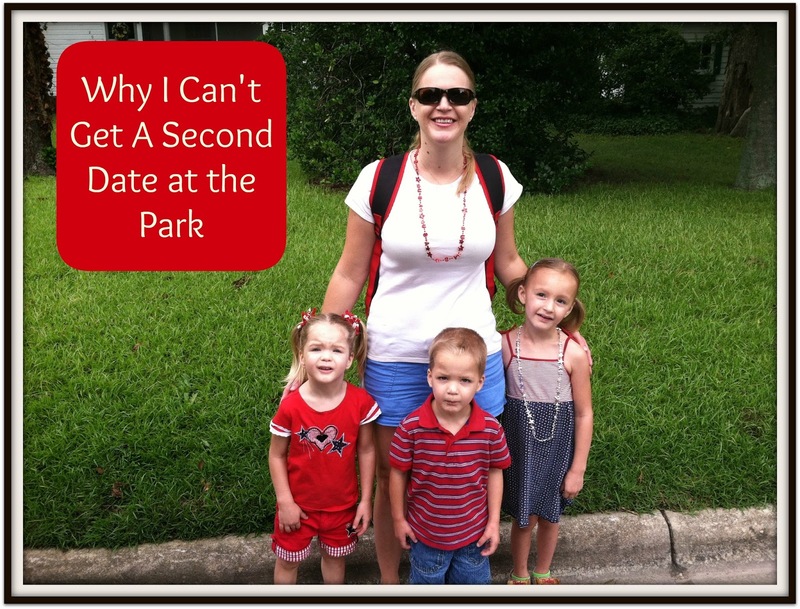 I agree—it's so hard to make friends with other parents at the park. I have a totally easy kid, so I guess it is all me. I thought I'd met a couple with a young boy at the park that could be friends, but then we both moved and I never had any contact info for them. Was it something I said???? I love your honesty-- finding like minded parents is difficult PERIOD. Thanks for sharing! I agree with the commentor above - it's hard to find parents who mesh with you really well. But honestly, it's just like any friendship - if you want to make it work, it will! I love the honest look at yourself, and even better at the other uptight parents - all so true! I can occasionally find someone for a conspiratorial chat while our kids rough house, but lasting friends? Nah. I learned to just enjoy the chat for the few minutes that I'm there and leave it at that. I'm amazed at how uptight some parents are, it makes me cringe when I think about how uptight I was with my first kid. I've learned to let go of so many things now that I have 3 kids. I love this. You are a great mom! We are thinking about a move and it scares me to think about finding people who "get" me and realize that with 4 boys, I have to let a lot of things go for the sake of my sanity. LOL! This cracked me up! Meeting at the park doe shave it's disadvantages.